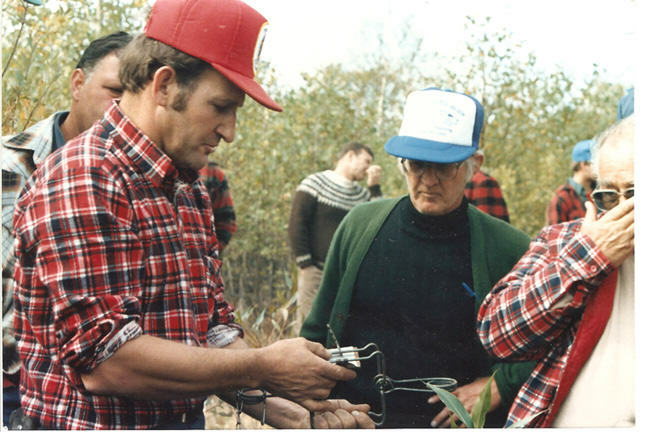 Holding a trapping workshop in 1986 with war veteran Roland Giroux. Here Alcide demonstrates a small Conibear trap used for marten. A primary goal of Truth About Fur is to give a voice to the real people of the fur trade. So what a pleasure it is to tell you about a newly published autobiography by one of Canada’s foremost trappers and trapping advocates, the legendary Alcide Giroux. My First Sixty Years Enjoying Nature as a Trapper promises, and delivers, a passionate and epic tale of a life lived in close harmony with the land: hunting, fishing and trapping. And thanks to Alcide’s extraordinary memory, he shares many wonderful adventures with us in vivid detail. The story begins in December 1951, near Sturgeon Falls, Ontario. Alcide was just six years old when his father moved their family onto the old homestead his grandfather had cleared and built in the early 1920s. There was no electricity or indoor plumbing, and young Alcide and his siblings had to cross the Sturgeon River in a small homemade boat before walking to school – a walk that provided opportunities for the young Alcide to snare rabbits to complement the moose and beaver in his mother’s stew pot. It was God’s Country back then, Alcide tells us, with wilderness and wildlife all around. Their trap lines began at the farmhouse door. A few years later, Alcide’s Dad built a remarkable suspension bridge to facilitate the family’s commuting. “We had so many curious and nosy visitors; they all came to see the 8th Wonder of the World … well the 8th wonder of River Valley!” Alcide recalls. I enjoyed reading about this remarkable DIY engineering feat all the more because I walked across this same bridge many years later when I visited Alcide’s trapline, in the 1980s. Eighth Wonder of the World! 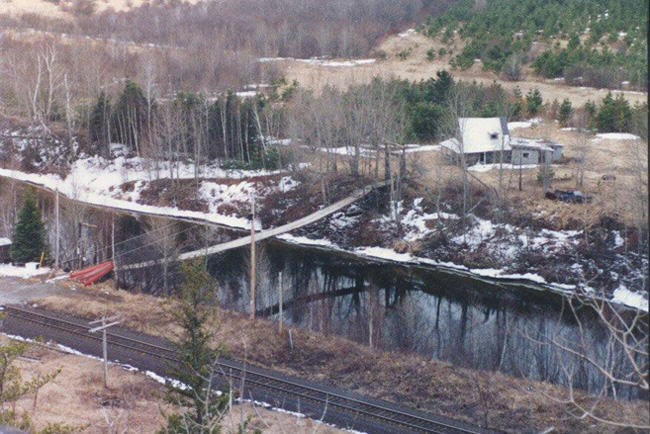 The old Giroux farmhouse, seen here in 1979, with the bridge Alcide’s father built in 1960. Alcide Giroux clearly learned his Dad’s lessons well; he became one of Canada’s foremost advocates for humane trapping. By the time he was 30, in 1975, he was writing articles in trappers’ magazines and leading workshops across Ontario and beyond, promoting the importance of researching and implementing better trapping techniques. In 1980, as newly-elected president of the Ontario Trappers Association (OTA), his first speech called on trappers to take the lead in humane trapping, rather than have changes imposed on them by others. He remembers that his beloved wife, Pat, sitting at the back of the hall, was worried about how this call for change would be received. But Alcide’s sincerity and straight talk won the day. 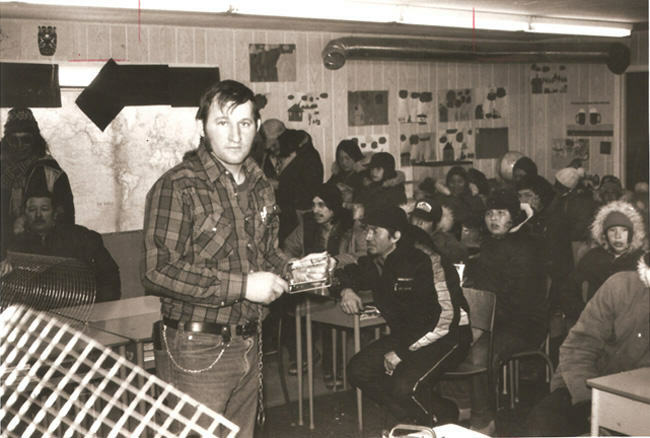 Leading a workshop for First Nations trappers in northern Ontario, 1980. 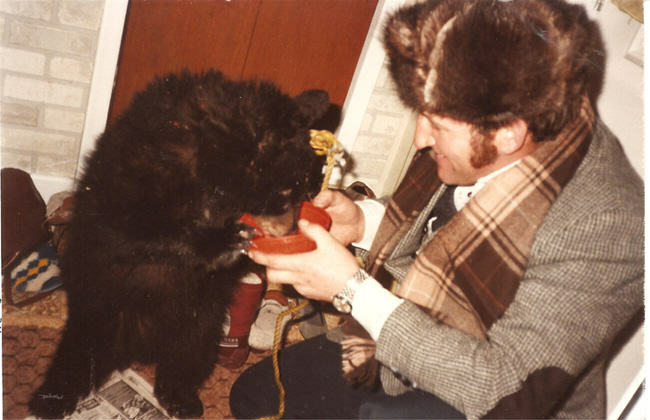 When the Fur Institute of Canada was created in 1982, to implement recommendations of the Federal-Provincial Committee on Humane Trapping (1974-1981), Alcide became a founding member, and later vice-chair. Accompanied by Pat, he travelled the world to lend his expertise to trap-research and conservation meetings in New Zealand, Europe, Louisiana, Australia and elsewhere. When scientists, politicians or journalists wanted to see a trap line first-hand, more often than not it was Alcide and Pat who received them. The woods ain’t a shelf in a grocery store. I want to see beaver cubs in that pond again. In 1983, Alcide found a new friend in bear cub orphan Ben. Alcide’s strength of character is also evident as he faces life’s more difficult moments: political battles in the OTA, a fire that destroys the old family farmhouse, and especially Pat’s courageous battle with cancer. In recognition of Alcide’s outstanding contributions, in May 2005 he was presented with the Fur Council of Canada’s “Furrier of the Year” award, at the North American Fur & Fashion Exposition in Montreal (NAFFEM). In his speech to more than 600 fur manufacturers, designers, retailers and government officials, Alcide reminded them that trappers did more than provide the beautiful furs on display in the hall. They were also front-line defenders of the industry, using responsible practices and educating the urban population – including furriers – about the importance of using nature’s gifts sustainably. Proud father, proud son! 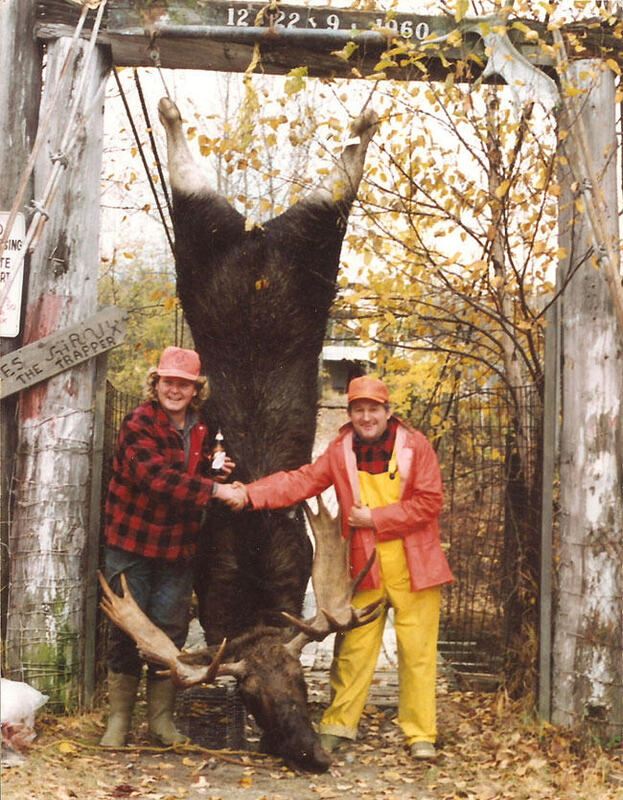 Alcide’s 16-year-old son Serge (left) bags his first moose, 1988. Speaking of nature’s gifts, for the gala fashion show that evening we had arranged for Alcide and Pat to sit with another celebrity: Miss Universe Canada, the beautiful Natalie Glebova. “Since trapping is always on my mind, I looked at Natalie and thought she would be good in the snow with legs like that!” Alcide remembers, with a chuckle. The setting for most of this book, however, is in the bush, and anyone who enjoys the outdoors will appreciate Alcide’s keen observations about nature and wildlife. To order your copy of My First Sixty Years Enjoying Nature as a Trapper, by Alcide P. Giroux (AKA “Ti-Lou”), email or call Angela Gurley of the Fur Council of Canada at [email protected] or on 1-800-376-9996. If ordering by email, please include your phone number so Angela can call for your credit card information. A French version is available, please specify whether you would like the book in English or in French. The price is $20CAD plus mailing and handling, about $6.50 in Canada and $12.50 for the US. Contact us for international shipping rates. Le livre d’Alcide Giroux est aussi disponible en français. CONGRADULATIONS ALCIDE ON YOUR BOOK, I HAVE KNOWN ALCIDE FOR MANY YEARS AND I HAD A TRAPLINE IN NORTHERN ONTARIO FOR 54 YEARS. IT IS TO BAD THE ANTI TRAPPERS WOULD’NT LOOK AFTER THEIR OWN AFFAIRS INSTEAD OF MEDDLING WITH OURS.SO WE COULD ENJOY OUR GREAT OUTDOOR LIFE. Your web site is energizing to say the least. Wow! wonderful commitment and a lot of experience, bravo!